Objective: In this unit, you will develop the knowledge and skill to depart a Class Charlie airport and fly to a second Class C Airport. Obtain a departure clearance from Clearance Delivery. Obtain a taxi clearance from Ground. Obtain a takeoff clearance from Tower. Comply with hand-offs to Approach Control and to Tower. Obtain a landing clearance, land safely, and obtain a taxi clearance to transient parking. Use the Los Angeles Sectional and a plotter (or SkyVector) to determine the magnetic course and distance from John Wayne (KSNA) to Ontario (KONT). Determine the appropriate VFR cruising altitude for the flight. Click here for a reminder on how to apply the VFR cruising altitude rule.. Determine checkpoints to help you keep the aircraft on your selected course. Determine the amount of time it will take to fly from KSNA to KONT. Determine when you will descend (top of descent). Determine the traffic pattern entry route. In this unit, your flight will be in busy Los Angeles basin. This is a good point to introduce Terminal Area Charts and FLY charts. 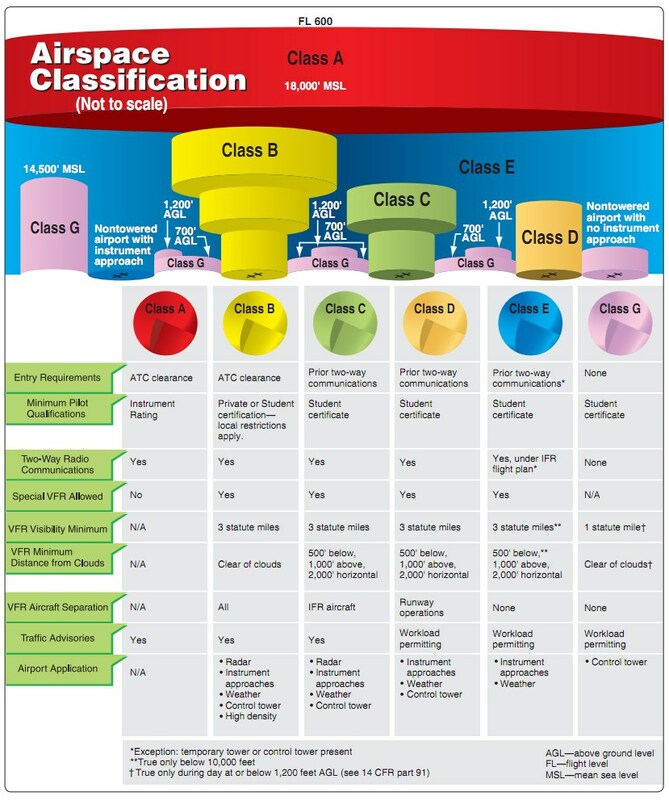 The Terminal Area Chart (TAC) is produced to help pilots navigate around busy and complex airports, primarily Class B airports. The scale of the is 1:250,000, half that of the sectional chart, so a lot more detail is included in the TAC chart. If you’re using SkyVector for your route planning, be sure to select the ‘Los Angeles TAC’ tab to see this level of detail. Here’s the route between KSNA and KONT plotted on the LA TAC. One of the valuable aspects of a TAC is the depiction of VFR checkpoints that are well-known to ATC. These checkpoints are identified by a magenta flag next to a landmark (lake, building, etc) with a bold, underlined label. In the route depicted above, Irvine Lake and Prado Dam are VFR checkpoints. ATC may ask you to fly over these checkpoints, and you can reference your position to these checkpoints as they are known to ATC. As you prepare for a flight, you should identify these checkpoints along your flight to ensure that you are familiar with all of the checkpoints that you might encounter. On the backside of the TAC, you’ll find Flyway Planning Charts, which depict flight paths and altitudes recommended for use to by-pass areas heavily traversed by large turbine-powered aircraft. Ground references on these charts provide a guide for visual orientation. 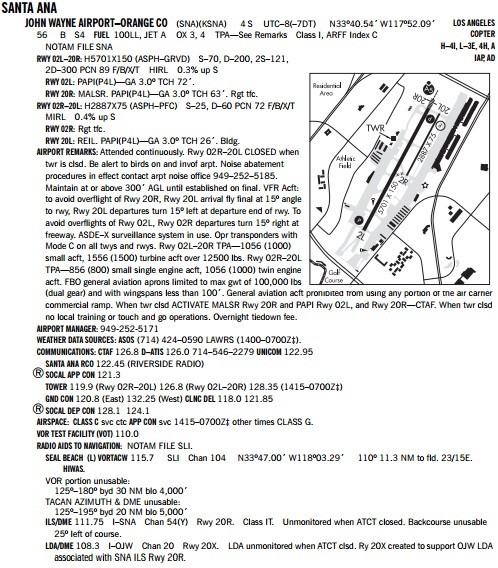 VFR Flyway Planning charts are designed for use in conjunction with TACs and are not to be used for navigation. There are some new symbols used on the chart; the FLY chart has its own legend, and here are some of the more useful symbols. The VFR Flyways are particularly helpful as they depict the direction and altitudes to remain clear of Class Bravo airspace and transition through the busy terminal environment. At Class Charlie and Bravo airports, VFR aircraft contact the ATC Clearance Delivery position prior to contacting ground. The primary purpose of the Clearance Delivery position is to reduce the frequency congestion and workload on Ground Control when issuing clearances. A transponder squawk code and approach control frequency to maintain communication while in the Class Charlie airspace. A helpful format to use when copying this information from Clearance Delivery is the CRAFT clearance format used by instrument pilots. In the case of a VFR departure, you won’t have a clearance limit, but you can still write your destination in. When you’re ready to copy your VFR departure instructions, contact Clearance Delivery, using the same initial call-up you would use to request traffic advisories from Ground, with one additional bit of information – your intended cruising altitude. John Wayne Clearance, Cessna 123AB is a Cessna 172 on the east ramp with Information Charlie, we'll be VFR to Ontario at 3,500. Cessna 123AB, John Wayne Clearance, on departure fly heading 330, maintain at or below 2,400, frequency 127.2, squawk 5445. Note how the controller will give you the information in the same order as CRAFT. Very helpful. Readback these instructions. Now, you can contact Ground and request a taxi clearance. If you forget to call Clearance Delivery before contacting Ground, Ground will not issue you a taxi clearance and will have you contact Clearance Delivery. Note that at some Class Charlie airports the Clearance Delivery position is not utilized full time. At the end of the ATIS, you may hear ‘Contact Clearance Delivery prior to contacting Ground’ when Clearance Delivery is active. In any case, you can’t go wrong with contacting Clearance Delivery first. If the position is not staffed, the ground controller will hear your transmission and instruct you to contact Ground to make your request. After taxiing to the assigned runway, obtaining a takeoff clearance from tower, and departing, you will be radar identified by the tower (a somewhat unique feature at John Wayne due to a radar position embedded in the tower) and then handed off to SoCal Departure. SoCal will then likely cancel the altitude restriction and instruct you to resume own navigation. Readback these instructions and proceed on course to Ontario. Visiting the FAA website, http://www.tfr.faa.gov, and verify that there is not a TFR in the area. A TFR map view is available making it easier to identify TFRs along your route of flight. Obtain a phone or internet weather briefing from Flight Service. Use an application such as SkyVector and Foreflight which overlay TFRs on top of charts. There is a ‘blanket’ TFR that covers any stadium having a seating capacity of 30,000 or more people were either a regular or post-season Major League Baseball, National Football League or NCAA Division One football game is occuring, or NASACAR Sprint Cup, Indy Car or Champ Series race is occuring, excluding qualifying and pre-race events. The TFR restricts aircraft from flying within a 3 NM ring around the stadium up to 3,000 ft AGL. The full text of the sporting event TFR is available here. Keeping track of all of these events, especially during the MLB season in the summer is challenging. Flight Service will not tell you about these TFRs during a weather briefing. SkyVector and Foreflight do depict these TFRs graphically. Disneyland is infamous amongst pilots in SoCal as as a ‘permanent’ Temporary Flight Restriction. This TFR restrict aircraft operations in a 3 NM ring around Disneyland up to 3,000 ft AGL. 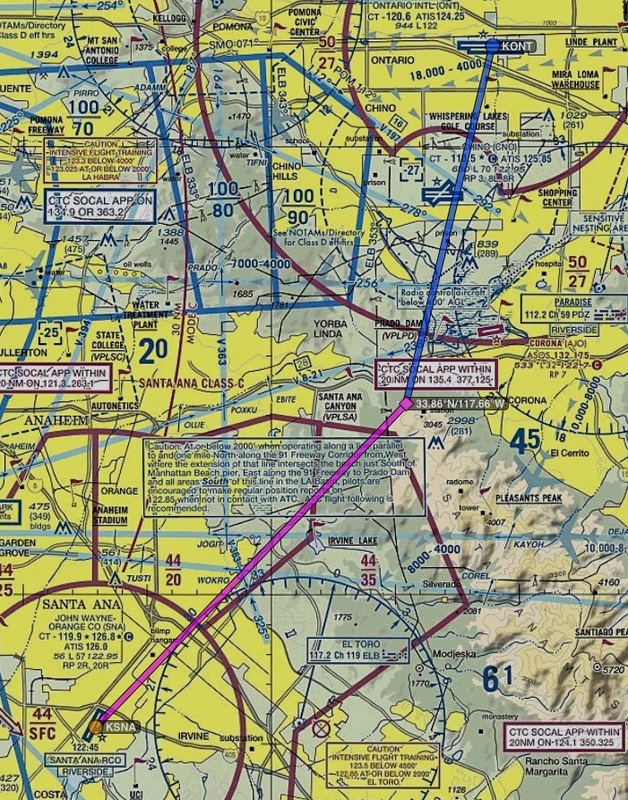 Just north of John Wanyne – Orange Co, you find examples of the Disneyland TFR and a Sporting Event TFR. SkyVector provides details regarding TFRs if you select TFRs as a layer, and then hover over the TFR. Clicking on the TFR will launch the FAA page with the complete details. PilotEdge does not currently support TFRs; controllers will not issue instructions to prevent you from flying through them, nor will you get ‘dinged’ for flying through a TFR. That being said, during this unit, you should fly as if the TFR did exist in PilotEdge and if you are not instructed to resume own navigation shortly after the handoff from John Wayne Tower to SoCal Departure, you should request own navigation to avoid flying into the TFR. Examine John Wayne – Orange Count (KSNA) and Ontario (KONT) airports on the Los Angeles Sectional chart and Southwest US A/FD and answer these question below. What type of airport is John Wayne airport? 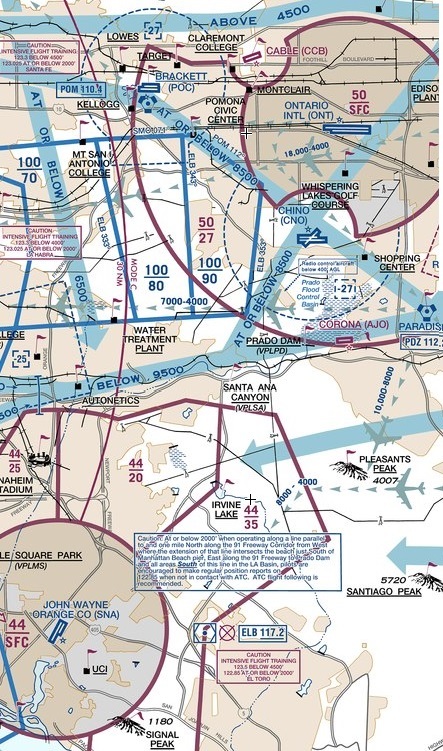 What is the field elevation of John Wayne airport? What is the traffic pattern altitude at John Wayne airport? What is the length of the longest runway at John Wayne airport? What is the ATIS, Clearance Delivery, Ground and Tower frequencies at John Wayne airport? What are the runway identifiers and traffic pattern directions at John Wayne airport? What are the hot spots at John Wayne airport? Determine what type of airspace is directly over the airport. What are the VFR weather minimums associated with this airspace? What is the ATC communication requirement to operate in this airspace? What is the equipment requirement to operate in this airspace? What type of services does ATC provide in this airspace to VFR aircraft?? What type of airspace is above the airport airspace? What is the equipment requirement to operate in this airspace under VFR? What type of services does ATC provide in this airspace to VFR aircraft? What type of airspace is between KSNA and KONT? What type of airport is Ontario airport? What is the equipment requirement and ATC communication requirement to operate in Class C airspace? What are the ATIS, CT and Ground frequencies at Ontario? What are the runway identifiers and traffic pattern directions at Ontario? What type of visual glideslope indicator does runway 26L provide? What are the runways lengths at Ontario? What is the field elevation of Ontario airport? Obtain the METAR and TAF for John Wayne (KSNA) and Ontario (KONT) at http://www.aviationweather.gov. Aviation weather products use abbreviations to communicate a lot of information in a small format. You can study this guide to interpret METAR and AWOS report. Console: Ensure Panel Master switch is on, throttle is at idle and mixture is rich. Select ‘Cessna 172 – KSNA – West Ramp’ flight file. 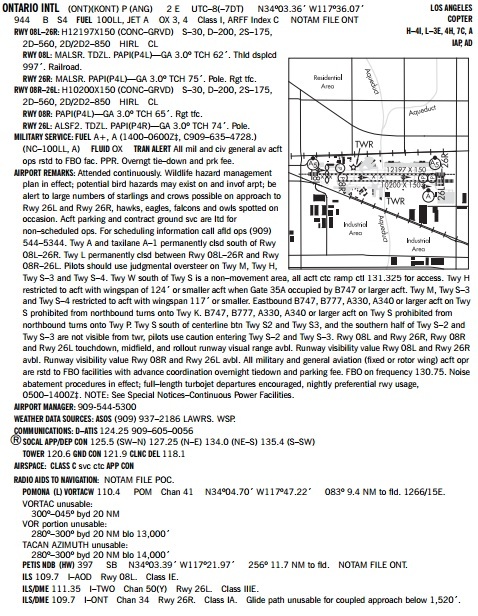 Print and review the airport diagrams for John Wayne – Orange Co and Ontario. Launch PilotEdge and connect to the PilotEdge network. Contact KSNA Ground and obtain a taxi clearance. Readback the taxi clearance. Taxi to the assigned runway. Complete the runup and before takeoff checks. Contact KSNA Tower and obtain a takeoff clearance. Have the SoCal Departure frequency in standby. Turn to the assigned heading after flying past the departure end of the runway. Expect and comply with the hand-off to SoCal Departure. Check in with SoCal and obtain ‘own navigation’. Ensure your first checkpoint is in view. Level off at your cruise altitude. Expect to be handed off to another SoCal Approach sector. As this sector will be the last prior to Ontario, check in with the ATIS. Comply with hand-offs to Ontario tower. Comply with the traffic pattern entry instruction from Ontario tower. Obtain a landing clearance, land, and exit the runway. Request taxi to transient to the south side of the airport. Readback the taxi instructions and taxi to transient parking. Reflect on the sequences of communication needed to obtain VFR departure instructions from Clearance Delivery at a Class C airport.